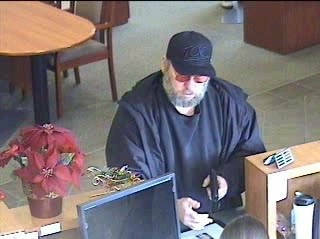 At about 2:22 p.m., the man entered the Heritage Oaks Bank on Froom Ranch Way near Home Depot armed with a handgun. One of the tellers then activated the silent alarm. When police arrived, they discovered the robber had fled with more than $5,000. Witnesses describe the robber as a white man, in his late 50s to early 60s, with blond hair and a thin grey beard. He was wearing amber-tinted glasses, a black baseball hat and a black jacket. First day on the job for San Luis Obispo police Chief Deanna Cantrell and she already screwed up by releasing the amount (more than $5,000) stolen in the bank robbery. YOU NEVER REVEAL THE AMOUNT STOLEN SO AS TO NOT INFLUENCE THE NEXT ROBBER! Why do banks post signs stating no caps, hats or sunglasses allowed and obviously do not enforce the rule? I guess it’s so honest people remove their sunglasses and caps. I know what you mean. They need to add a sign that says, “No Bank Robbers”. Maybe they can enforce it equally with the no “caps, hats or sunglasses” sign. On the other hand if someone was pointing a gun at me, I would give them permission to wear their sunglasses! Why do all banks put cameras up high? Most of the time we get pics of ball caps bills. When will they learn to place the cameras at eye level and one at the door? This guy likely came in before to case t he place. Don’t these banks have guards anymore? Robbed by a thin, frail man in his 60s with a water pistol? Come on guys. Where does it say he was thin and frail? He looks pretty fat to me. I posted the comment pre picture – misread thin beard as thin, beard. They say the camera does add 10 lbs though! That’s true. I took a look at the photos from his earlier robbery in Goleta and he looks even fatter in that one – I guess that camera added 50 lbs! or maybe he used his spoils from the bank robbery to buy lots of cheeseburgers. Well heck, you’ll for sure find this guy at Adam Hill’s house. Another example of AHDS ! Anyone who believes they can live on SSI alone is a fool. Anyone who robs a bank, aside from being a criminal, is an idiot. Let’s hope he’s caught soon. Where is the nexus to SSI? Foolish assumption. Sorry, my comment was meant to be a response to Rambunctios–see below. Boomers on the prowl…I told you SSI is not enough! My social security birthday letter says when I retire, there will not be enough to fully fund the obligation. Bank robbery might look like a better and better option. Remember, by the time some of us are retirement age, Living in a Van Down by the river will probably be illegal. Maybe you should start contributing to your 401k. Social Security was never meant to be a retirement plan, rather a measure to keep working people out of abject poverty. Retirement is on our shoulders, not the governments. Relax, I’m saving. But sadly, not everyone can. And there were times in my life that I was not able to save. And there may be times in my life I may not be able to save again. None of us really know, do we? I like to stay humble. Now, people count on Social Security because it is taken out of pay checks on a regular paycheck just like a pension would be. People get a birthday statement with a “promise” that the money will be paid. So, yeah, it’s really not the “Government’s” money when they take it out of the taxpayer’s pocket, then give you a statement every year and tell you they are holding it for you. I mean, come ON. Even YOU have to know that’s pretty messed up. They are ALREADY skimming off interest to pay for those who have lived longer than expected or who have never even paid into the system in the first place. With jobs being outsourced and environmentalists wanting to do away with places like Diablo and replacing them with candle factories and dandelion fields, I would say more and more people will need their tiny checks. Read carefully. Witnesses described him as a white man with a thin grey beard, NOT a thin man. If you look at the photo, you will see that, rather than being thin, he appears to be rather overweight. Looks like most overweight white guys to me. Racist and sexist. Oh wait, I forgot white men are the only non-protected class. If only he were gay. Democrats don’t need to be that creative. They are at home drawing on our social security and Medicare at age 28 for back pain and anxiety, talking on their Obamaphones. And before you get mad slower faster, you started it with the republican comment. You practically asked for it.